In the decade up to 2020 European higher education has a vital contribution to make in realising a Europe of knowledge that is highly creative and innovative... Europe can only succeed in this endeavour if it maximises the talents and capacities of all its citizens and fully engages in lifelong learning as well as in widening participation in higher education. The E4 Group on Quality Assurance (ENQA, ESU, EUA, EURASHE) was asked to continue its cooperation in further developing the European dimension of quality assurance and to ensure that the European Quality Assurance Register is evaluated externally, taking into account the views of the stakeholders. The work on the independent assessment of the Bologna Process launched in the previous period continued until 2010 and the final results were presented at the Ministerial Conference, Budapest, 11 March 2010.
to prepare a work plan up to 2012 to take forward the priorities identified in this Communiqué and the recommendations of the reports submitted to this Ministerial conference, allowing the future integration of the outcome of the independent assessment of the Bologna Process. To follow-up on the recommendations of analysis of the national action plans on recognition. To implement the Bologna reforms and to make progress in all priority areas, strong efforts will be required especially at national and institutional level. To support these efforts with joint action at European level, the Ministers entrusted the Bologna Follow-up Group to prepare a work plan for the period leading up to the Ministerial Conference in 2012, including the Ministerial Anniversary Conference on 11-12 March 2010 in Budapest and Vienna. 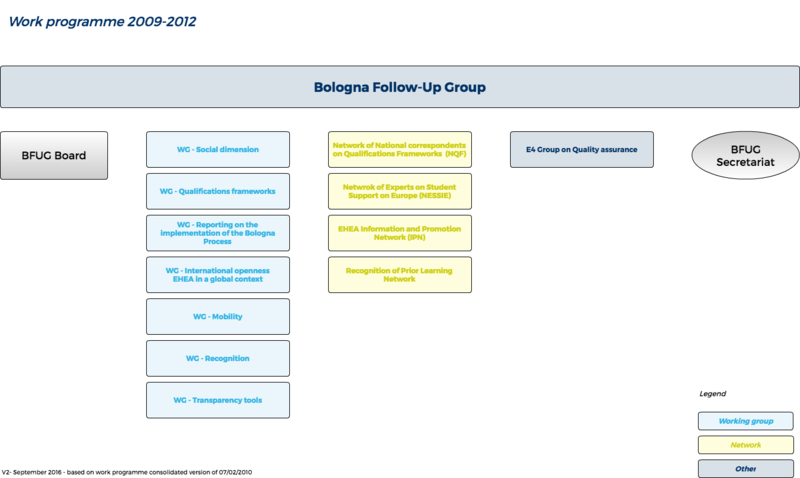 To further disseminate the Bologna reforms, countries and organisations participating in the Bologna Process also organise various seminars and conferences.